May is, by far, our favorite month of the year! The way to a man’s heart is through his stomach. That sentiment could work for your clients as well. May is your chance to act, and there are lots of ideas to pursue. Here are some bar-b-que themed promotional product ideas: Throw a party for clients and vendors and serve up fresh ribs, chicken and pork. Make sure to use logo-ed napkins and plates and provide everyone with a reusable logo-ed cup they can take home. 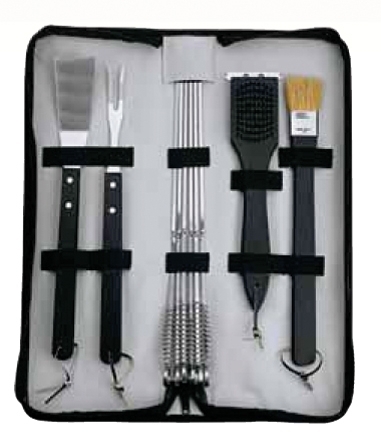 Send barbecue-themed direct mail promotions with sauces, barbecue utensils and meats for grilling. If you’re looking for something really unique, give everyone a steak branding iron in the shape of your logo. Call us anytime to start a delicious brainstorming session. Whether the receptionist works at your office or at your clients’ offices, today’s the day to recognize the important work s/he does. Internally, they are often the one who keeps the office running smoothly, so consider giving them something special like leather desk accessories. And, when visiting clients, make sure you drop off a nice gift for the receptionist, as they are often the key to your getting an appointment. Today we remember all those who have served this country. Take the time to run a promotion that recognizes our heroes and their sacrifices. Sponsor a local parade; walk the route and hand out American flags with logo-ed sticks or give away patriotic tattoos. Volunteer at a veterans’ center and bring lots of logoed red, white and blue products. The goodwill promotion will generate a lot of positive feelings and great press.